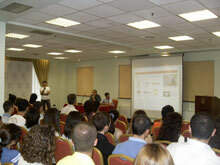 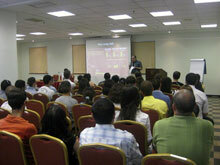 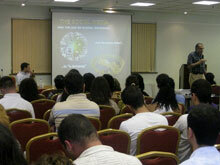 On July 17 IT School had organized an open lesson in Congress Hotel. 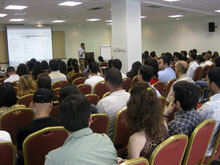 Opening speech by IT School representative Samvel Movsisyan. 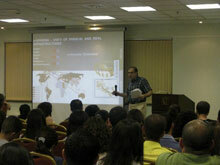 Aram Hajian (dean, AUA College of Engineering) is representing opportunities for Armenia in the global and local ICT trends' field, with an interesting perspective example about the connection of Armenian chess traditions and artificial intelligence researches. 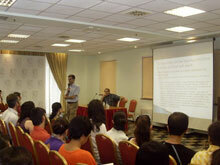 Garegin Chugaszyan [Facebook address] (Information Technologies Foundation) is delivering interesting views on social networks-instigated tectonic changes, migration to the cyberspace, knowledge societies' development scenarios, and institutional and mentality changes necessary for Armenians to answer the mentioned challenges. 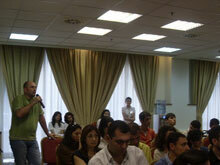 Participants are asking questions and registering to participate in IT School projects. 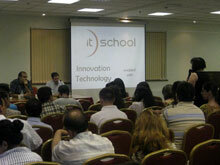 * Especially for the people, whose participation we had to decline: we are sincerely thankful and appreciate your interest towards the IT School, so we are eager to notify you about our future events (please register).